← Holy Tu Quoque, Batman! I’m travelling today, so have a bit of time to briefly comment on this recent paper by Glecker et al. 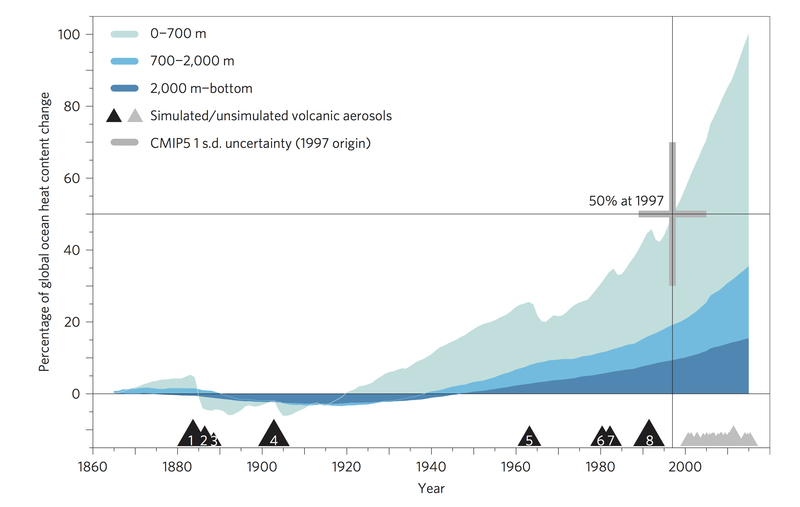 which suggests that Industrial-era global ocean heat uptake doubles in recent decades. One of the key results – shown in the figure on the right – seems to be that 50% of the energy increase since pre-industrial times has happened since 1997. There are numerous other reports discussing this paper, so I thought I might just comment on one potential significance of this. If you consider the classic Skeptical Science figure, something like 93% of the planetary energy imbalance is associated with heating the oceans, while only 3-4% is associated with heating the land and atmosphere (the rest is associated with the cryosphere). As a rough estimate the land and atmosphere has a mass of about 1019kg and a heat capacity of 1000 J kg-1 K-1. Therefore 1022J would increase the temperature of the land and atmosphere by 1K. The paper being discussed here suggests that the ocean heat has increased by about 3 x 1023J since pre-industrial times, with 50% occuring prior to 1997. If this is about 93% of all the energy accrued, then that implies a total of 3.2 x 1023 J, with 1.6 x 1023 J accruing before 1997, and an equal amount afterwards. If we consider only the land and atmosphere, then prior to 1997 between 5 x 1021J and 6.4 x 1021J was accrued by the land and atmosphere (i.e., 3% – 4% of the total). Given its mass and heat capacity, this would have increased temperatures by between 0.5K and 0.65K. Looking at the Skeptical Science trend calculator, this looks quite reasonable. However, given that this paper is suggesting a similar amount of energy was accrued after 1997 as before, we’d expect the amount of surface warming to be of a similar magnitude. However, it clearly is not. It’s warmed much less since 1997, than it did before 1997. So, based on this paper, it seems that global warming has indeed been accelerating, but that this has not manifested itself in the warming of the surface. If so, it does seem to confirm that surface warming can be quite variable, which is probably no great surprise. Could surface warming remain slow? Seems unlikely as you can’t keep accruing more and more energy in the oceans without the surface eventually catching up. Given that we may be about to have 3 warmest years in a row, we might be at the beginning of some kind of speed-up. Time will tell, though. Anyway, I actually have to run now, so will leave it as is. Apologies if there are some errors and typos – I haven’t had a chance to proof-read this properly. Any clarifying comments or other thoughts welcome. This entry was posted in Climate change, Climate sensitivity, ENSO, Global warming, Science and tagged 1997, Anthropogenic Global Warming, Gleckler, Global warming, Ocean heat content, OHC, Skeptical Science, surface temperatures. Bookmark the permalink. This is the way I see it. Heat leaves the ocean through the skin layer: sensible, latent, and net OLR. The skin later is lying on top of a column of water. When the upper layers of that column are very warm, on net, then some of the energy entering the fails to make it into the oceans. It’s all happening in the skin layer. If the skin is resting on hot water, then less energy in; more energy out. When the skin is resting on cooler water, wind and upwelling, more energy makes it through the skin and into the oceans: more in, less out. What 2014 proved is an ocean skin resting on a column of water at the temperatures of ENSO neutral conditions can shift enough energy to the atmosphere to result in a warmest year. With a positive energy imbalance, no significant heat can leave the oceans. Energy that makes it through the skin, sunlight, cannot just jump through the skin and leave. You either have a skin on a cold column, less sensible, less evaporation and less net OLR, or skin on a warmer column, more sensible, more evaporation and more net OLR. So cooler temps only when there is significant wind and upwelling. It will be interesting to see how far the anomalies drop as this El Nino slides into ENSO neutral conditions. So the rate of ocean heat uptake *has* in fact increased – as I suggested last time this came up and everybody told me I was incorrect. I think this phenomenon is too complex for a simple answer. With the oceans having 1000 times the heat capacity of the atmosphere, the thermal exchange between the two and any (slow) approach to global equilibrium will be dependent on the many complex details of ocean circulation systems and ocean-atmosphere interactions, not to mention critical interactions with the cryosphere (or cryohemispheric polar caps?). I wouldn’t be surprised if a representative time scale for the overall process would be on the order of centuries. But it spells out the importance of improving our multidimensional (3D space, time, temperature and chemistry) knowledge of the oceans. True, but I think on shortish timescales it’s the well-maxed layer which is relevant and that has a heat capacity 50-100 times that of the atmosphere. Of course, we do have to eventually warm the whole ocean, but I think the transfer of energy to the deeper ocean is typically assumed to be diffusive and hence quite slow. As I understand it, the rate at which we can warm the deep ocean will essentially determine the difference between the TCR and the ECS. Not clear if they’ve adjusted for lack of pre-industrial volcanism initialisation in CMIP5 historical runs. Gregory et al. 2013 is referenced and the supplementary information mentions a volcanically adjusted time series once, but the figure above has a trajectory reminiscent of the poorly-initialised (1850) CCSM4 run shown in Gregory et al. Figure 1 – the overall cooling up to 1920 is a giveaway. It doesn’t make much difference for trends in recent decades but the industrial-era percentage since 1997 could be considerably smaller – maybe 25-30% instead of 50% – since there is much more early 20th Century thermosteric sea level rise in the well-initialised CCSM4 run. I think it would be difficult to reconcile the trajectory in the above figure with historical sea level reconstructions. Thanks, I did wonder about that. Presumably you can do some kind of comparison between sea level rise and this to see if it makes sense. I think of it has the rate heat out has decreased as sunlight us what goes into the oceans, and that has not changed. Only the statistically inclined expect a gradual trend in atmospheric temperature over these time scales – and those who game this assumption to say because it isn’t a trend it isn’t caused by global warming. Atmospheric warming is step-like. The thermal exchange between the atmosphere and ocean is gradual in and abrupt out. We have to stop dealing with climate as a set of statistical artefacts and treat it as a physical system that has to be understood and characterised appropriately for a range of purposes, mostly to do with decision making. Magma is correct it would take the best part of a millennium ifTrenberth is correct and heat can reach the deepest part of the Oceans. If the Planet gains less heat than it radiates away then planetary temperatures fall. So its the imbalance that causes the temperature change. The problem is that we’ve already warmed by almost 1K, which has offset some of the forcings and feedbacks, and we continue to emit GHGs. The planetary energy imbalance now is not an appropriate measure for how much warming we might expect. It would only be appropriate if we were to fix atmospheric CO2 at today’s concentration (about 400ppm). The reason we will continue to – on average – warm is because we continue to emit CO2. Bryan, 870 years needed to warm the oceans by 1 C, is likely a too slow estimate.. According to NOAA/NODC the ocean layer 0-2000 m (about half the total ocean volume) has warmed by 0.05 C in the last ten years. With that rate, it would take 400 years for the 0-2000 m layer to warm by 2 C, equal to one 1 C for the full ocean volume.. The first figure in this post probably illustrates it well. The red line shows what would happen if we fixed concentrations. Initially we would warm quite quickly given the relatively large energy imbalance. As we approach equilibrium, the energy imbalance would reduce and warming would slow. After a few hundreds years we would probably be fairly close to equilibrium, but would probably sustain a small planetary energy imbalance – and therefore continue warming slowly – for many hundreds, or maybe thousands, of years. Tamino addressed this issue with his two-box model of climate. One box represented the atmosphere and had a short time constant for reaching equilibrium, while the other equilibrated much more slowly. The thing is that until the entire system is in equilibrium, energy-in will exceed energy-out. Temperature determines equilibrium. The thing to remember is that ECS does NOT include slow feedbacks (ice sheets, vegetation). These will kick in, so the ECS will actually be exceeded in reality. For instance, as I recall, the global temperature rise predicting collapse of the Greenland ice sheet is only 2 degrees or so, with considerable uncertainty. ECS is a lower, not upper bound on the temperature rise. An educated blue collar ex-insulation contractor’s seat-of-the-pants guess: the cryosphere, particularly in the Arctic, & let’s including permafrost too. The above references to it suggest its dynamic are understood to be not well defined, and given the latent heat of ice, and what that ice and permafrost has been doing since 1997, is it likely that defining its influence as a remainder of what the more studies areas are known with greater confidence to be doing is, with a better known energy imbalance, sloppy and lazy. Accurately observing what the planet system does with the heat gain isn’t easy when the signals of the trends wanting to be observed are lost in the “noise” of incomplete data, incomplete models, and limited computing power. I interface with the interactions of scientists that I read from the perspective of the metaphor that the science has gone from painting its picture by sloshing out paint from 55 gallon drums, to painting with a 3′ floor broom. The apparent fact that we can measure the earth’ energy imbalance to the hundredths of watts per square meter is huge, but this also means that it is highly probable that some very painstakingly gathered data and, perhaps more importantly, under appreciated interpretation of that data, will be needing to be rethought…as the more recent comments are a simplistic example of. Nice juxtaposition: Bryan’s comment following Roger Jones somewhat makes the latter’s point. The latter’s point, or the former’s point? The problem is the mechanism that warms the oceans by a “negligible” amount frequently shifts gears and a small part of that warming, a sliver, instead ends up in the atmosphere <a href="http://mashable.com/2016/01/20/2015-hottest-year-record/#_v.AWEo38kqH"where it ain't negligible. If this is correct then this level of global warming by this method is completely negligible. Your antecedent is not correct, and your consequent does not follow. Your formula (incorrectly) assumes that all the energy will be retained by the ocean. And by the time the ocean has warmed by 1 C, the surface temperatures in the polar regions will have increased by 4 to 10 C.
Besides, a 1 C rise in the average ocean temperature would be accompanied by a sea-level rise of approximately 2.3 metres due to thermal expansion and melt-water from ice-sheets. The points you make do not help your point which presumably is that a one degree rise in average sea temperature would be “apocalyptic”. “Your formula (incorrectly) assumes that all the energy will be retained by the ocean. Yes, my assumption is for the minimum time required for the rise of one degree. Of course it is going to be much, much longer than that. Not all the heat will be retained as molecular translational KE. Only the visible part penetrates beyond one centimetre or so of the Ocean surface. Could you give a link for this conclusion? Besides all that, the scenario you describe would involve a wait of a minimum of another 42 years just to melt the arctic ice. Either Trenberth is correct and heat can reach the deepest part of the Oceans (and in the CO2 panic period timescale) or much more likely, that he is not correct. Either way it should bring you some comfort that the massive thermal inertia of the Oceans will rule out any “apocalyptic” scenario. Please keep the CAGW meme for your favorite contrarian network, Bryan, and please don’t try peddle it furthermore in the thread while ignoring everything else. Thank you nevertheless for your concerns. Maybe just consider what Willard said, along with the fact that your calculation doesn’t really support your assertions. I’m not sure if your question is serious, or even quite what it is that you’re asking. Could you try reading my previous comment for comprehension? Linky is there. Even so, the arctic polar ice floats and Archimedes found that this will not give rise to any change in sea level rise (apart from a minimal thermal expansion). You’ve never been to Greenland or the Canadian archipelago, have you Bryan? Very Reverend Jebediah Hypotenuse perhaps should read this….. Anyway I have presented a first law of thermodynamics equation which indicates that ( given the usual warmist assumptions) it will take about a millennium at least for the average Ocean temperature to rise by one degree Celsius. I helpfully gave all the numbers so that folk could work it out for themselves. Nobody has pointed out any errors in my calculation so I guess it must be correct. This blog claims to be interested in physics although that remains to be seen. Or, it’s a very complex system and what seems contradictory to you, isn’t really. No, you didn’t really. You showed that if you assume that the ocean warms uniformly it would take this long. This assumption is, however, wrong. The upper ocean (top 50 – 100m) equilibrates with the surface rapidly (a few years). The deeper ocean takes a long time – the deepest parts maybe taking so long as to be essentially irrelevant. Unless you’ve had your eyes closed, the surface has already warmed by about 1oC, so it clearly doesn’t take a millenium for that to happen. I actually didn’t read to the end of Bryan’s comment, so I had missed that. A number of people have pointed out issues with Bryan’s calculation. He’s either missed those, or is convinced that despite people pointing out these errors, that they haven’t done so. I think I may have just established who Bryan is. I can’t imagine why “the oceans are big, therefore…something” hasn’t convinced more people. Closed-minded dogmatists, the lot of you. This does not seem to be correct when we’re talking about oceans. The salinity shifts the density-temperature profile ‘to the left’ so that the density of seawater will increase with the decrease of temperature up until freezing point. Presumably you can do some kind of comparison between sea level rise and this to see if it makes sense. If we take thermosteric contribution from 1997 to 2014 (end of study period) to average 1.5mm/yr, that’s a total of 25.5mm. Using the 50% figure and an assumption of linearity between ocean heat content and thermosteric contribution, that means total thermosteric sea level rise between 1860-1870 to 1997 is 25.5mm, averaging 0.2mm/yr. Looking at the range of sea level reconstructions indicates minimum 15cm rise between 1860-1870 and 1997, which averages to about 1.1mm/yr. So, rate of mass contribution would need to have been at least 0.9mm/yr. Using a 25-30% figure, total thermosteric sea level rise between 1860-1870 and 1997 is about 69mm, averaging 0.5mm/yr. Mass contribution would then need to be a more manageable minimum of 0.6mm/yr. Thanks. That would seem to suggest that it’s tricky to reconcile the sea level rise with the suggestion that 50% of the ohc increase happened before 1997 (and 50% after) unless mass contribution was pretty large during the 1860-1997 period. An article, including graphics, about the PNAS study that JCH linked to in his above post.